It is snowing heavily in Madison once again and the high temperatures this week are topping out at around 20 degrees. The snowflakes are gigantic as they float down from the sky. It is mid-March as we all know and we are anxious for signs of spring. On the bright side of the weather situation I have just bound off and blocked a brand-new wool sweater and incredibly enough I will still be able to wear it for awhile. How's that for some positive thinking? Right from the start I want to give you all of the links you need to find out more about the sweater I made from Amy Detjen's (a Meg Swansen and Elizabeth Zimmermann protege) Craftsy.com online class called Custom Yoke Sweater. Click here for a special discount link just for my blog readers to receive the Custom Yoke Sweater online Craftsy class for 25% off! Click here for the Sipsey's Folly Ravelry project page! 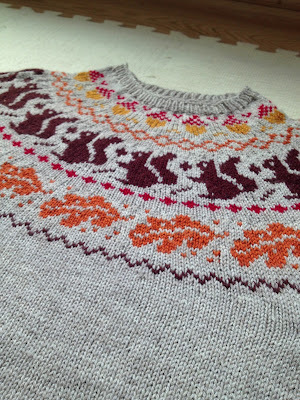 Click here to see Amy Detjen's Ravelry page! Click here for Brown Sheep Nature Spun Sport Yarn! I bought my yarn in a kit directly from Craftsy. The yarn and the kit are both very reasonably priced. Now for some information about the making of the sweater. The craftsy class for this sweater is called Custom Yoke Sweater. There are worksheets for making a completely customized sweater using your own measurements as Amy takes you step-by-step through the process. What a wonderful offering. Amy is a nationally known knitting technical editor and knitting instructor. She has taught and assisted Meg Swansen at Knitting Camp for over 20 years. To be able to get this instruction online is such a treat. 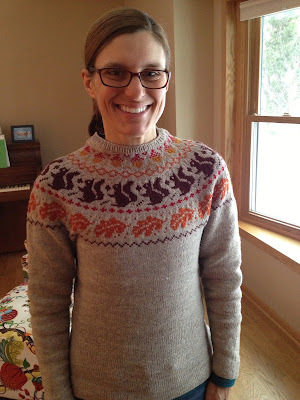 The sweater basically uses Elizabeth Zimmermann's formula for creating a yoke sweater but Amy takes it farther by adding more shaping and other elements for a perfect fit. The other option to this online class is that Amy offers an already written out pattern for a wide range of sizes. If you don't want to take measurements and calculate so much you can just pick your size and start. That's what I did. I made the smallest size Amy had to offer in the written out pattern section and dove right in. In the top photo you can see the sleeve hem with the hidden stripes. I like to finish as much as possible along the way when knitting a project. I finished the body hem, the sleeve hems, wove in the ends and grafted the underarms all before getting to the neckline. 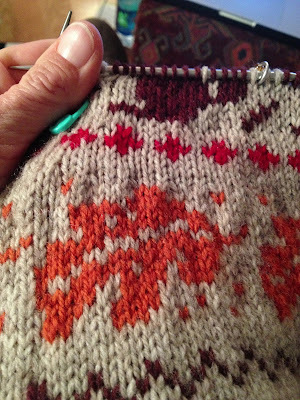 When I bound off the last stitch, I was done with every part of the sweater. That's such a good feeling. 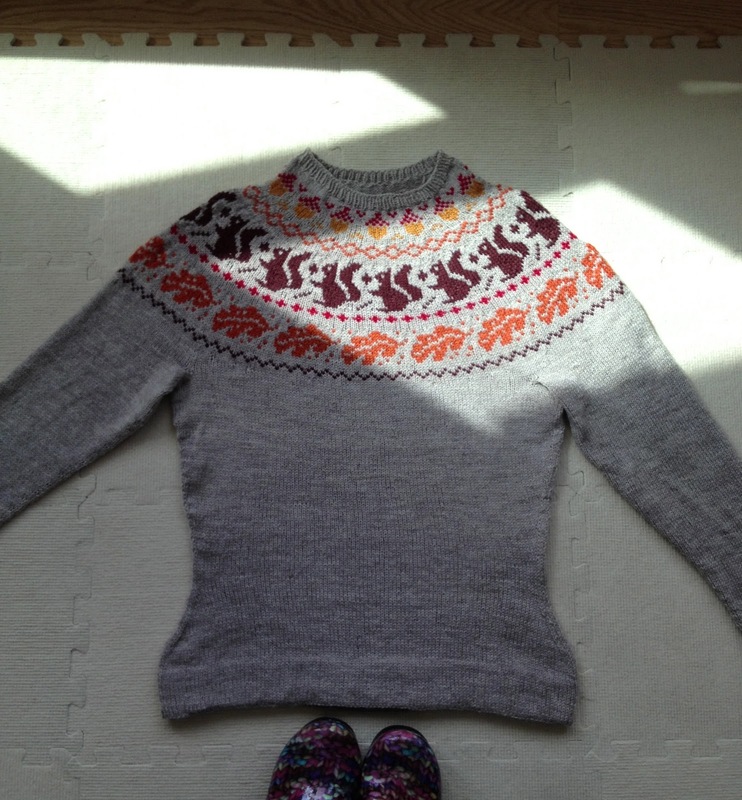 Here I have just joined the sleeves, it is a bottom-up sweater, and have completed the first chart of colorwork. I couldn't wait to get to the leaf knitting in the orange color. After the leaves are worked you get to have your first major decrease round to get rid of loads of stitches. This is such a relief after working the mega-huge rounds. I do have to point out that if you are not interested in the fall motifs of my version of Sipsey's Folly, Amy offers a garden-themed version rounds to choose from as well. 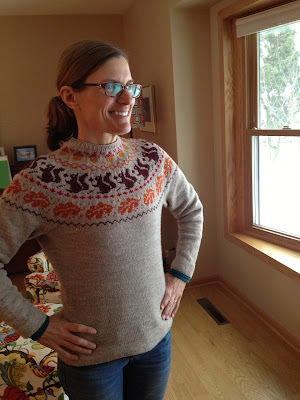 I am thinking about making the garden version of this same sweater at some point soon. I enjoyed knitting the fall-themes so much. Here you can see the colorwork growing and the feet of the squirrels taking shape. It's so motivating to see the colorwork growing from your fingertips. You can see that it gets a little bumpy from the major decrease round. This all blocks out in the end. Last Saturday I worked on the yoke quite a bit. Here is my squirrel hot off the needles. Super cute! I did Elizabeth Zimmermann's Sewn Bind-Off at the collar and threw the sweater on over my head and took this photo right away. I hadn't blocked the sweater yet but I couldn't resist wearing it first for a few hours. The fit is amazing. The only thing I did a tiny bit differently is that I added 1/2 an inch to the sleeve length and 1 inch to the body length. Everything else is exactly as written. The pattern is perfection. I soaked the sweater in a basin of lukewarm water for about 20 minutes. I gently rolled out the excess water in a couple of clean towels. Then I gently spread out the sweater on my blocking boards. The wool smelled so good from the Soak Wash in the Amy Butler scent (I don't think this is available any longer). The yoke smoothed out beautifully. I love how washing the wool makes the stitches even out so nicely. It makes a world of difference. The other good thing from washing is how soft the wool becomes with washing. Well, here you have it. It is soft, cute, fits great and it even smells good. I can comfortably fit a long-sleeved tee underneath. Here my arms are down at my side. The sleeve and body lengths are just right. I learned so much from this pattern and the online course. Amy is a delightful, smart, cheerful, informative and funny teacher. That is the best kind. I highly recommend this class for any interested colorwork yoke sweater knitters out there. I just love my new sweater! Thank you, Amy Detjen and Craftsy.com for a wonderful knitting experience. 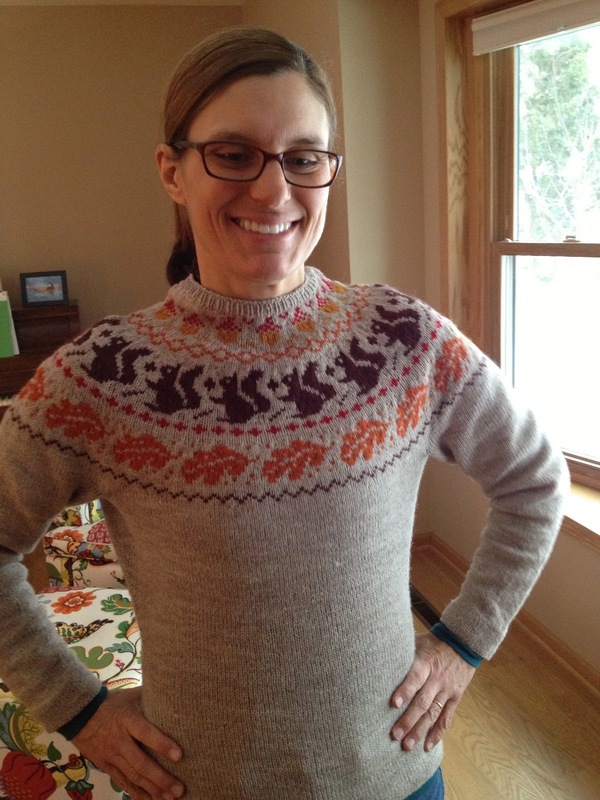 Here is the link for the discounted Custom Yoke Sweater Class one more time! p.s. I am not going to make this a cardigan or change anything about it ever. It's perfect as is. It looks great on you! I would love to take this course but the link is not working. Could you check the link please? I purchased Amy's class as well, but haven't yet bought the yarn. I did find that the Craftsy yarn price was the same price I found at online retailers. There was no discount on the yarn for buying the class. Also, there was a better shipping deal at the online retailer, so it was cheaper than the Craftsy deal. The discount link is fixed! I want to see a pile of your handknit sweaters!!! What a great, Fall sweater. It is adorable and so you. You sold me! I want that sweater! Not sure if the kit is still available, though. I'm assuming it was in the Craftsy yarn shop? Betz - I don't know if Craftsy still has the kit available or not. I bought it when the class first came out and it was on the Custom Yoke Sweater page on the site. This sweater is so sweet, Susan! I love this sweater. My nieces and nephews think it is the funniest thing that I am afraid of squirrels - showing up in a squirrel sweater would make them giggle! Unless I am reading it wrong it seems that by following the Ravelry link the price is discounted 50% instead of the 25%. Karen - definitely use the 50% off link then! I just put the link Craftsy provided for me to use in the blog post.